At approximate 6:50 pm in Paris, the Notre-Dame Cathedral caught fire. As one of Paris’ most iconic landmarks and its most visited monument, Notre Dame is a treasured part of the city to both locals and visitors. Hearts were aching to watch the beautiful building in flames. Locals typically enjoy taking in its views while sitting along the Seine, and visitors marvel at its views from both inside and outside, including iconic features such as its gargoyle sculptures and stained glass windows. The fire started with flames and smoke billowing around the cathedral’s towers, and the inferno quickly spread across the building to shatter the windows, destroy the roof, and cause the iconic central spire to collapse. Authorities were scrambling to contain the fire, but the cathedral’s fate was uncertain and audiences were sharing thoughts of their devastation both in person and online. At around 11:00 pm in Paris, reports came in saying that the Notre-Dame Cathedral’s main structure would be saved. As reported by CNN, both towers of the Notre Dame cathedral survived the fire, according to Laurent Nunez, France’s secretary to the interior minister. One firefighter has been seriously injured, and two-thirds of the roof has been destroyed, according to the Paris Fire Brigade. French President Emmanuel Macron has announced that, starting Tuesday, he will launch an international fundraising campaign to rebuild the Notre Dame Cathedral. 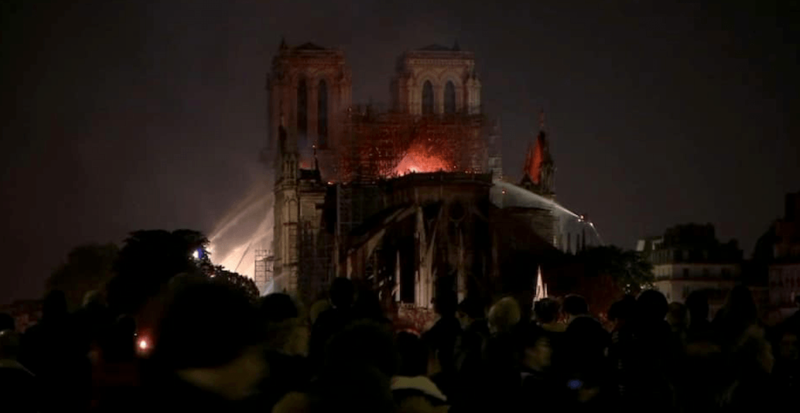 On the scene, Macron describes the fire as a “terrible tragedy,” but said the “worst had been avoided.” He added that the cathedral’s facade and two main towers did not collapse during the fire. “I’m telling you all tonight — we will rebuild this cathedral together. This is probably part of the French destiny. And we will do it in the next years. Starting tomorrow, a national donation scheme will be started that will extend beyond our borders,” said Macron. Crowds remain gathered outside the cathedral, praying and singing hymns. Images shared online show the devastation that occurred.